Depositions. Court and Private Trials. Arbitrations. Mediations. Public and Private Hearings. Corporate Events. 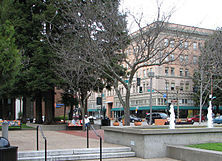 Santa Rosa - California's hidden gem. Our office is located approximately ten minutes south of Charles Schulz Sonoma County Airport and approximately one hour north of San Francisco and Oakland airports. These are just a sample of fine establishments which we can refer to you. For additional referrals, please contact us. "We had a private trial where six of the witnesses were spread out from Colorado to New York. Instead of flying around the country, Redwood Reporting was able to coordinate with various remote locations near each witness and via videoconferencing we were able to conduct the questioning in two days. Very time efficient and cost-effective." Copyright Redwood Litigation Services 2017 All Rights Reserved.